Google Docs is maybe the king among Web-based collaborative editing and document sharing applications, but the productivity suite from the all-mighty giant is not the only fish in the sea. An open source Web-based solution, co-ment provides an efficient document collaboration environment which offers everything you need to edit, annotate, and share documents. co-ment is not just a mere Web-based word processor, though. While you can use co-ment as a no-frills Web-based word processor, it's designed for easy and efficient document annotation. You can create documents from scratch in co-ment, or you can import existing documents. co-ment uses OpenOffice.org as its conversion back-end, so you can upload documents in virtually any format supported by the productivity suite. co-ment supports three different markup systems for formatting your documents: markdown, RST, and HTML. However, you don't have to apply formatting manually, as co-ment's editor sports a graphical toolbar which gives you quick access to all essential formatting options. co-ment also features version tracking functionality; every time you save the document, the system automatically creates a separate version of the document, and you can revert the document to a previous version at any time. When it comes to annotating, co-ment really shines. 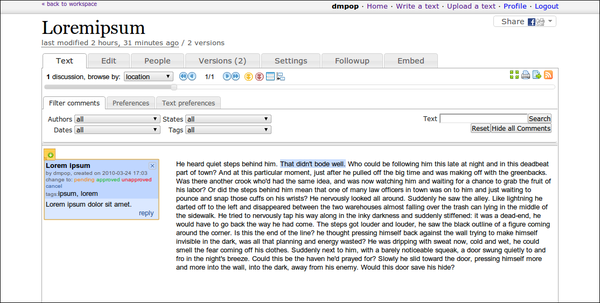 In the view mode, users can add an annotation to any part of the text. Each annotation appears as a note to the left of the document. Users can assign multiple tags to each note, and you, as the document owner, can change the note's status (Pending, Approved, Unapproved, and Cancel). Any user can attach a reply to a note, so notes can be used as threaded conversations. co-ment provides filtering options which can help you to quickly locate specific notes, and you can use the navigation buttons to jump between the notes. These features can come in handy when you have to deal with dozens and even hundreds of annotations in a single document. Using co-ment's user management capabilities, you can invite new users and specify their roles. And, when needed, you can export the final document (with or without the annotations) in the HTML, PDF, or ODT formats. The hosted version of co-ment is not free. But if you want to try the service, you can either use the older or lite version of co-ment. Alternatively, you can download co-ment and install it on your own machine. The latest development release of the software is available at http://www.co-ment.org/. co-ment 2 uses Pandoc markdown (not OpenOffice.org) as its pivot format.